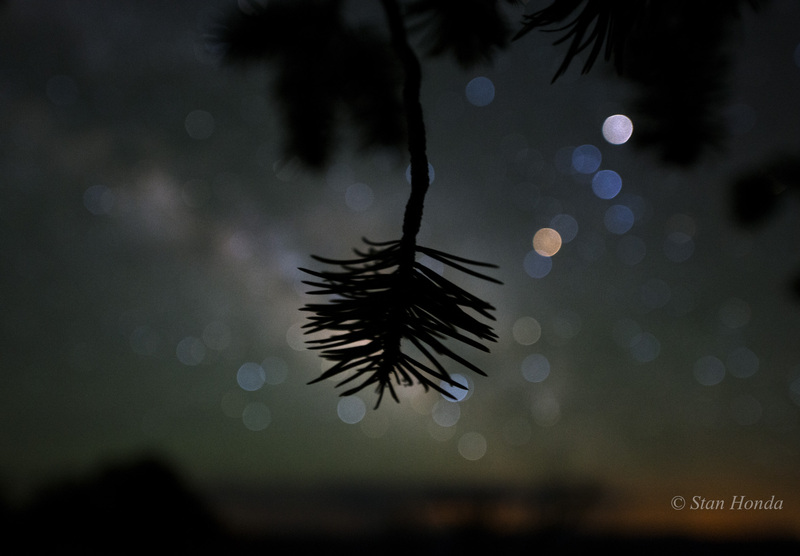 Explanation: Beautiful, luminous decorations on this pinyon pine tree are actually bright stars in the constellation Scorpius and the faint glow of the central Milky Way. Captured in June from the north rim of the Grand Canyon of planet Earth, the shallow, close focus image has rendered pine needles on the tree branch sharp, but blurred the distant stars, their light smeared into remarkably colourful disks. Of course, temperature determines the colour of a star. Most of the out-of-focus bright stars of Scorpius show a predominately blue hue, their surface temperatures much hotter than the Sun's. Cooler and larger than the Sun, and noticably redder on the scene, is giant star Antares at the heart of the scorpion. In focused, telescopic views the whitish disk at the upper right would be immediately recognizable though, reflecting the Sun's light as ringed gas giant Saturn.